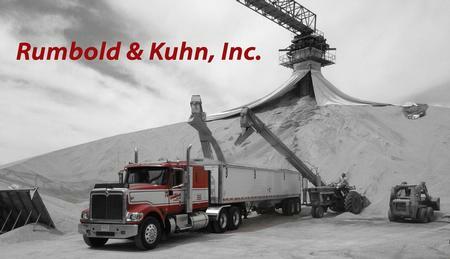 The Rumbold & Kuhn grain company made its beginning in 1952 when Ezra Rumbold and John Kuhn bought the Lawless Elevator in the Stark County village of Duncan, Illinois. In July 1965, John Kuhn exited the partnership due to health concerns. 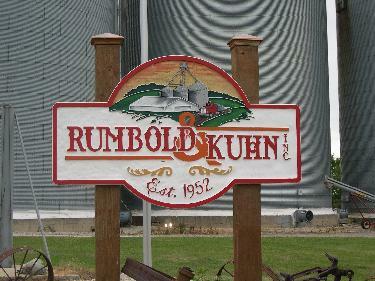 However, the Rumbold family chose to keep the familiar Rumbold & Kuhn name throughout the years. With the advent of corn pickers shelling corn on the go, Ezra (pictured above), along with son Elwin, started batch drying at their farm, in what is known locally as the Valley in rural Wyoming. As seed genetics and farming practices then improved, the amount of grain handled increased as well. In 1976, Elwin thought he needed to "get bigger or get out of the grain business" as he did not want to turn anyone away. He then added the first of eventually four large flat storage warehouses at the Valley location, in addition to bulking up the receiving and adding a continuous flow drying system. Although the trucking has been present since inception, in an effort to better serve the farmer over the years, Ezra Rumbold & Son trucking company has evolved into a fleet of 15 trucks. The Speer elevator was purchased in 1977 from Allen Grain Co. In 1991, R&K acquired the Farmer Co-op Elevator in Putnam. Then in 2001, the Princeville facility was purchased from Tabor Grain. The most recent acquisition came in 2004 with the purchase of the Wyoming, Toulon, and Kewanee facilities from Knobloch Grain Co.
After the passing of Ezra and Elwin, the third generation of Rumbold's- Mike, Mark, Dave, Gregg, Jeff, and Marjie, along with their mother Loretta- continue to own and operate Rumbold & Kuhn, Inc. Services offered now include grain storage, grain drying, merchandising, trucking, grain vac & auger wagon rental, full line feed sales, and seed sales. Owners and employees alike maintain a proud tradition of customer service and a commitment to quality.